This is the fourth page attempting to produce the limb bauplan, consolidating the concepts from the previous brainstorming. Instead of trying to play with simple fins, I decided to associate them with the side lines to justify the double mirrored sets of paddles. I also settled on the alternating zigzag growth pattern for the skeletal elements, because it is highly unusual for Earth animals, and so suitably alien. Then I decided that given the ungodly number of appendages the gracile alien has, they may well have an embryology that adapts the basic limb plan to all sorts of unintuitive purposes, like Earth’s arthropods do (producing limbs, antennae, eyes and mandibles from the same machinery). And then it finally clicked. 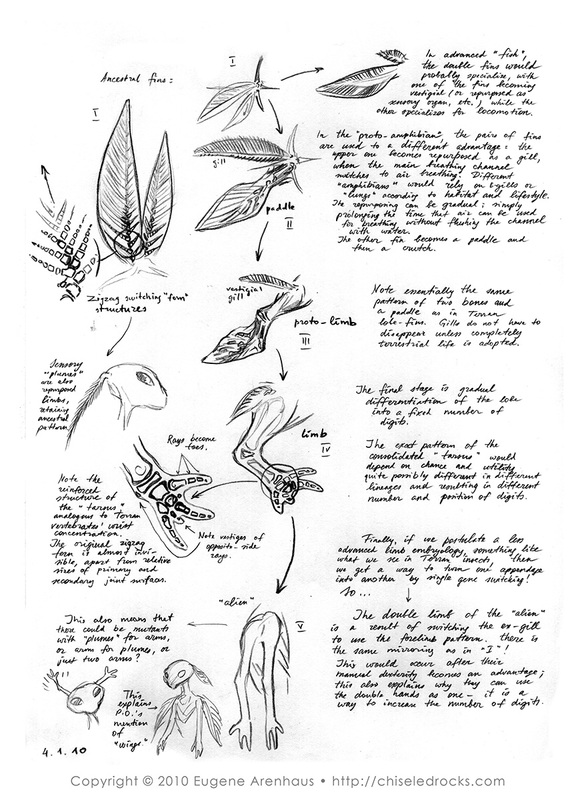 The basic plan is a “fern” structure making a fin, but then you can break it in so many ways, producing external gills, sensory surfaces (which is what the gracile alien’s antennae were retconned as), reducing and fusing skeletal elements to produce the gracile alien’s “double” joints with interstitial bones and remnants of extra rays becoming muscle attachment points, etc. The mirrored shape of the ancestral paired fin also explains the alien’s mirrored hands, elegantly. One disturbing consequence of using the “arthropod” approach to embryology is that you can have mutations converting one type of limb into another - like the flies that have legs instead of eyes. Could there be mutant aliens who sport tiny hands in place of their antennae? In any case, arms mutated into antennae explain P.O.’s incongruous mention of optional “wings” on these critters.